While Ms. Commander-In-Chief's cd came out last year, it has started to catch on Youtube and on Facebook. She is a singer, songwriter and a seven-string guitarist. The first time I became aware of her, was watching her rendition of Black Sabbath's Paranoid. While her vocals were not the first thing that got my attention, her guitar playing did. 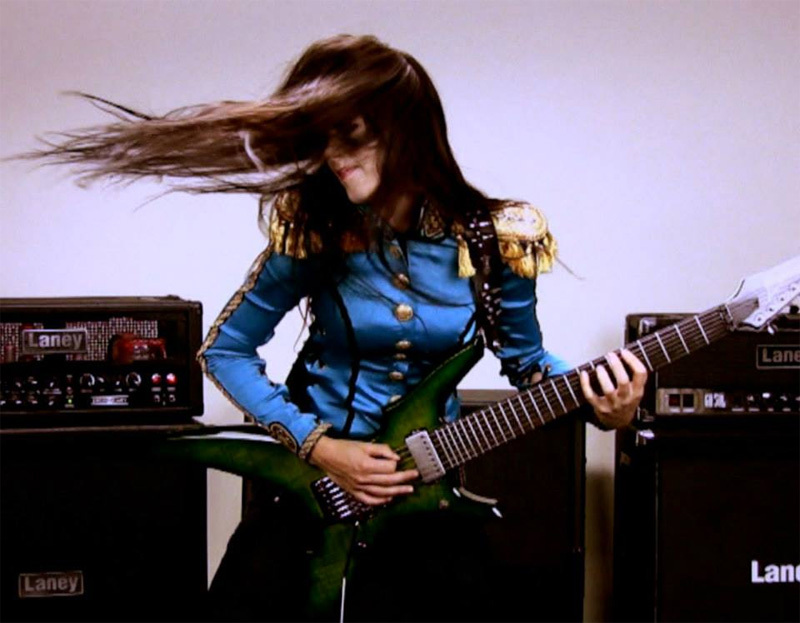 I am a fan of seven string guitarist, and I have not met or seen many women who play them. There are a lot of people in general, who feel six is adequate or plenty for their needs. The Commander In Chief: blinded by hair. The first song, is the single, Evolution, in which a video(see below) was recently released. The song in my opinion, is about the dangers of science, and the people who are willing to do whatever it takes to conduct the experiences they want to do. Her overall guitar tone is right in your face, like her vocals. Her falsetto is out of this world, and its definitely a matter of opinion, if you will like it or not. 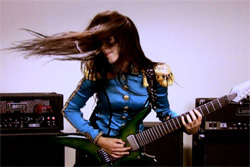 Her guitar solo shows what an amazing talent she has with her axe. Famous is next, has a very cool muted guitar riff during the verses, while a more stop and go riff during the chorus. Speaking of the chorus, you can hear some amazing technical guitar riffs behind her voice. The amazing production by Sterling Winfield (Pantera, Hatebreed, HellYeah) should get the credit, for showing off The Commander's talents equally. Thou, is the third song on this disc, and it has a very addicting guitar groove over her voice during the verse. The chorus sounds like a mix of punk vocals, and her higher pitched falsetto. Its an interesting mix that again, will probably fall into the love/hate it realm of opinions. This at four minutes and fifty three seconds is the longest song on the EP. Let It Go, is the final song and it is my favorite song on the disc. 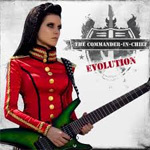 You have a very slow yet groove-inspired riff with the Commander's voice being somewhat restrained. She sings in a much softer and melodic fashion. While she still uses her falsetto, it has more a fluttering effect to her voice. This song shows she is equally adept at singing as she is at playing guitar. The ripping yet melodic solo that comes in at the two minute and fifteen second mark, is one of my favorites on the disc. It is very brief, but fits the song itself perfectly. The first time I heard this solo, I had to rewind back to hear it again. Its one of those solos, that you don't easily forget. Hail to the seven-string Commander-in-Chief. Easily recommended for open minded metalheads and those who believe musical talent is not gender based.